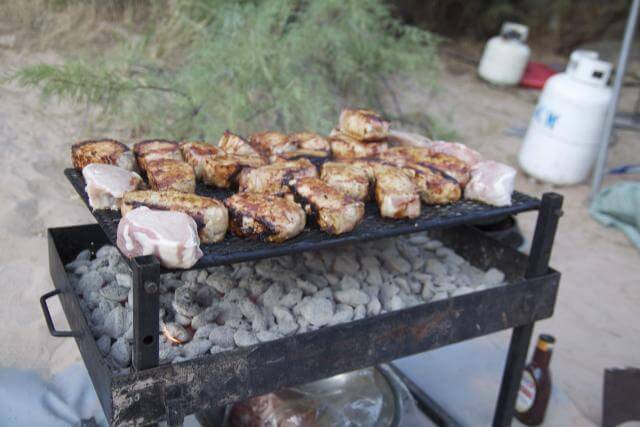 One of the most surprising aspects for many guests on our Colorado River raft trips seems to be the quality of our meals. If you’re expecting typical camp fare — hot dogs and canned beans — you’ll really be impressed with what our guides are capable of creating. Prior to every rafting trip, a lot of time is spent planning and organizing menus. Scheduled deliveries ensure that only the freshest, high-quality food is packed and, thanks to our ability to carry ice, we are able to keep fresh fruits, vegetables, steaks, chicken, as well as your favorite desserts, throughout even our longest trips. 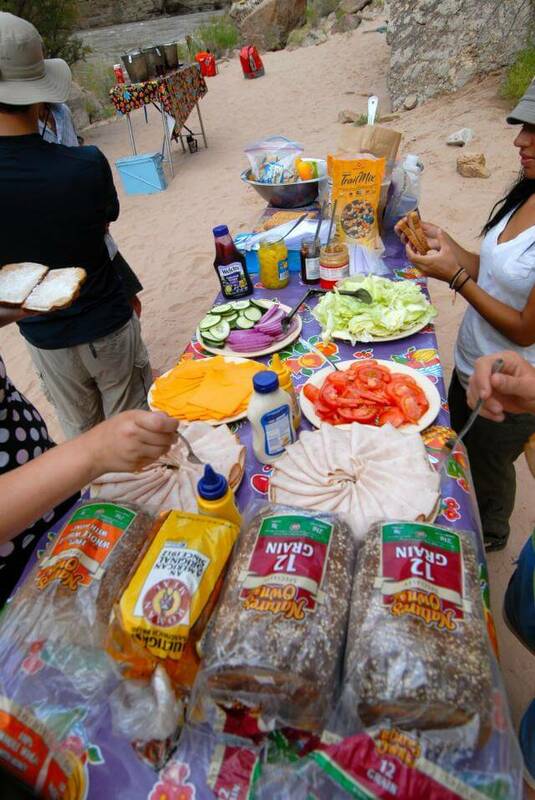 So what is a typical meal on a Grand Canyon Whitewater expedition? Breakfast might be made-to-order eggs with hash browns and yogurt, French toast with bacon and fresh fruit, or blueberry pancakes with sausage and English muffins. For lunch, you’ll often have a spread of deli meat (the good stuff) and fresh veggies, or maybe taco salad, with salty and sweet snacks on the side. Dinner is usually a big hit. Our menu includes from-scratch lasagna, salmon, steak, spaghetti, and fajitas, all served with all the fixins. You’ll have appetizers and salads, and every dinner comes with side dishes like wild rice, mashed potatoes or grilled vegetables. And the best part: dessert! Guides prepare Dutch-oven brownies and cake and serve strawberry shortcake and cheesecake on GCW rafting trips. Besides the three big meals, we also provide an assortment of on-river snacks: fruit, granola bars, candy bars (A river trip is no place for a diet!) and salty treats. Beverages we provide are a mix of diet and regular soda and electrolyte mix and of course water. If you prefer a certain brand you may want to consider bringing an additional supply. We do not supply alcoholic beverages. If you would like beer, wine or liquor on your trip, we recommend bringing it with you or, if you are hiking into the canyon to start your river trip, using the beverage order system (details in your trip information packet). We can accommodate some dietary restrictions, including vegetarian, vegan, gluten-free diets, and nut allergies as long as we have lots of advance notice and some help from you in supplementing what we’re able to provide. If you have questions about your specific dietary requirements, please don’t hesitate to ask. Many guests have great things to say about our menu but keep in mind that a river trip is ‘adventurous & exciting but not luxury & gourmet‘.